RLD leader @jayantrld hits back at PM Modi with new name for acronym BJP. @RahulGandhi will release the manifesto. Congress is not willing for alliance in Delhi, confirms @ArvindKejriwal. "The revolutionary 'Nyay', the party's proposed income guarantee scheme, will change the face of India"
Sinha said it was "painful" for him to leave the BJP. "That is the difference between us," said Yogi Adityanath. "Rahul Gandhi has fled to Kerala as he fears that Amethi voters will seek an account from him." "We will win from both the seats." Yechury said the breakdown of talks with the Janata Party in 1977 in Bengal had benefitted the CPI(M). Mayawati alleged that Bhim Army was formed by the BJP as part of its conspiracy. "He (Modi) said he'll give you Rs 15 lakh, that was a lie," said Rahul Gandhi. "It's our commitment that we'll give special status to Andhra Pradesh," said Congress chief. "He should have contested from a constituency where BJP is contesting," the CM said. The Congress spokesperson accused BJP of "attacking" South India's culture. "This is not a fight with any party but a fight against divisive forces," said Surjewala. Congress chief will contest Lok Sabha elections 2019 from two seats, the party announced on Sunday. Many believe that winning from Chandni Chowk seat is like opening a door to power. Kejriwal also attacked PM Modi, saying the worst thing he did was "pitting Hindus against Muslims". In the video, the minister can be seen misbehaving and abusing the official. The Bharatiya Janata Party has started extensive preparations for this campaign. "The countdown to PM Modi's defeat has begun," Chandrashekhar Azad declared. The toll plaza manager has blamed the Uttar Pradesh administration for the incident. He joined the grand old party in the presence of Mallikarjun Kharge, Ashok Chavan and KC Venugopal. Sena workers are now planning to stage a protest against Poonam Mahajan. "There cannot be turncoat tigers..." Pawar tweeted. The big cat is the Sena's logo. NPA burden on public sector banks in Braj region has crossed Rs 250 crore this election season. The book mentions the Rafale deal as PM Modi's first mistake. Congress seems to favour the BSP-SP-RLD alliance to cut votes of BJP. ‘BJP bhagao, desh bachao,’ tweets Congress. The Patna Sahib MP hinted he would not be working under Narendra Modi anymore. 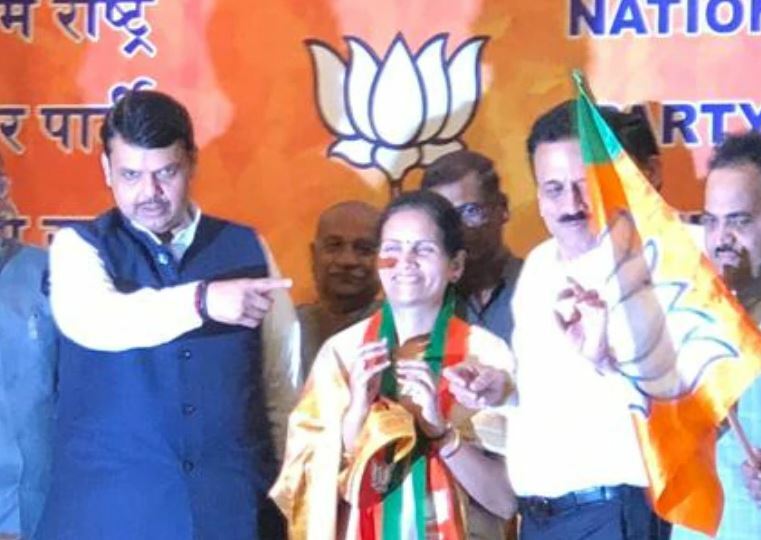 NCP leader Bharti Pawar joins BJP.